Unitrack Template (2 pieces). Great for planning your Dream Unitrack Layout. Kato has produced an automated electronic crossing gate, complete with lights, sounds, and infrared sensors for detecting locomotives and cars! Fully automated and DCC friendly! 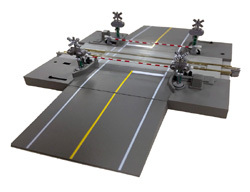 This crossing gate will feature multiple selectable warning sounds, smooth moving crossing gates, and a fully enclosed and automated system for detecting trains and lowering and raising the gates – no button pushing necessary! This is to extend the crossing gate to multiple tracks. This is to extend a sensor further away. • Used with #24-840 turnout control. • Used with #20-650 Automatic Crossing Gate. • Used to connect track leads to power pack. • Used to connect Signal Power Supply to power pack. • To extend wires from Signal Power Supply to Signal.